On Friday evening, 17 Juniors and Senior teams have warmed the German ice rink. The Cup of Berlin lived the ISU short programs. Skyliners from the USA and the Finnish Marigold IceUnity are for the moment atop of the competition. In the Junior division, the American Skyliners charmed the judges and the panel. The team from New York skated a shiny and powerful short program in Berlin, receiving a score of 55,35 points. Dream Edges from Finland are 2nd with 52,71 points. This season, this team from Kaarina is skating their short program to a music of the « Cirque du Soleil ». At the 3rd place, Valley Bay Synchro from Finland also. Their short program to different songs of David Bowie and Queen was filled with speed and choreography. They earned a total of 48,68 points. Everything is still possible in this competition because scores are tight. For example Ice Infinity (4th) is close to the team coached by Andrea Gilardi Hot Shivers (5th) and Team Berlin Juniors (6th). Cool Dreams Junior from Switzerland and Team Darlings representing the Czech Republic are almost equally with scores of 32,35 and 32,36! By Seniors, Marigold IceUnity from Helsinki presented a very good short to Matadors theme. They receiving for this performance a score of 67,07 points. 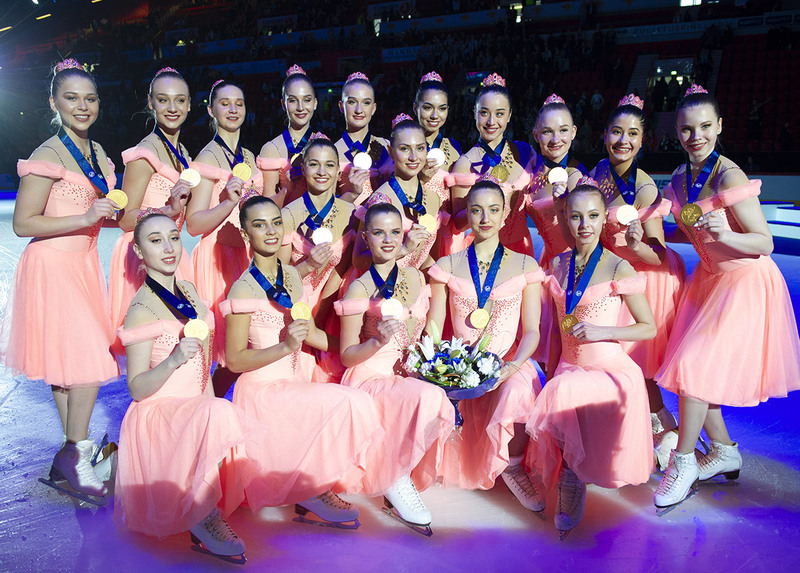 Haydenettes from the USA did also a clean program dressed in red and orange (score: 63,30 points). The second American team Crystallettes finished 3rd after the short. Their skate was emotional and their steps were clean. The music was « Lean me on » by J2 feat Sizzy Rocket. Crystallettes did a score of 58,22 points. Team Berlin 1 from Germany is 6 points behind with a program full of unity and control (52,43 points). Their short program is skate to « Sometimes When We Touch » by Dan Hill. The team will try to give its best tomorrow to be on the podium. Four other teams competed in Senior. Team Olympia from the Czech Republic seem to improve their skating skills this season and presented a touching program on « Heal The World » by Connie Talbot (41,59 points). Supported by the public, Cool Dreams from Switzerland placed behind with a total of 37,61 points. Team Ice United from the Netherlands earned 28,34 points and the British Team Spirit did 26,75 points on a piano version of « Chandelier » by Sia. 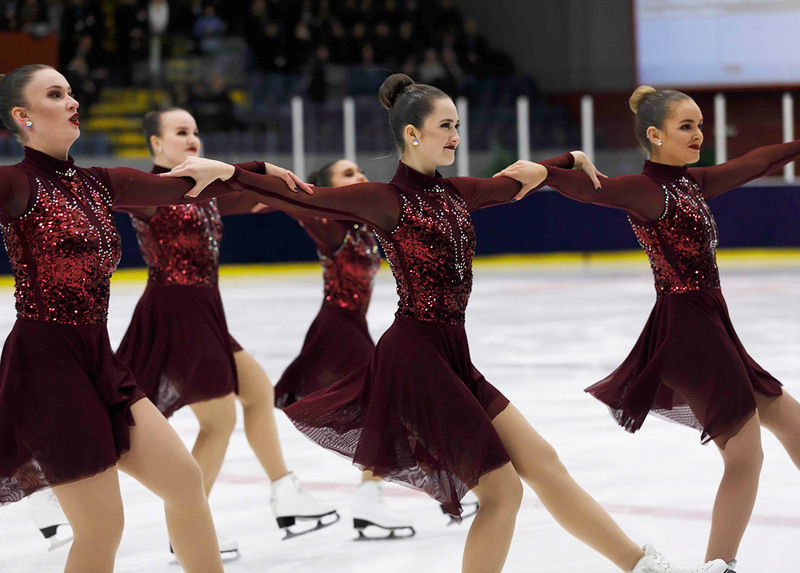 See you on Saturday for the free programs and the final scores on Jura Synchro!